Veronacard is an all-inclusive city-pass that gives you free or reduced entry to the city main museums, monuments and churches together with free city bus travel. 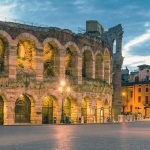 Enter the scenographic Arena Amphitheatre, step out onto the legendary Juliet’s balcony, go up the Lamberti Tower to enjoy a breath-taking view, visit the most beautiful churches in Verona…and discover much much more! 18 Euro for 24 hours and 22 Euro for 48 hours after the first validation.